Jack Gabel, (b. 1949 -) presently lives in Portland, Oregon. He has traveled extensively, throughout Europe, Africa and Asia and worked many summers as a commercial fisherman in Alaska. 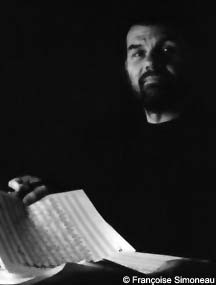 Jack Gabel has written numerous concert hall works for many different combinations of instruments and voices, with and without electroacoustic accompaniments and/or enhancements. He also creates mixed-media works alone and with collaborators, using musique concrete and poetry, frequently his own, some of which has been published apart from its use in contemporary performance pieces and more traditional settings for singers. Though classically trained with composers Derek Healey, Tomas Svoboda and poet Ralph Salisbury, Gabel recounts as his most memorable musical experience, the impromptu jam session he had with an Afghan tribesman in a Herat tea house in 1972 -- the composer on mouth organ and the local talent holding forth on his handmade, rough-hewn, 3-string lute. The two miraculously found a common modality straight away and carried on for several hours. "No concert-hall premiere or recording session can to date compare," adds the composer, "nor likely ever will." Today, Gabel's work is infused with widely varied ethnic and ancient colors and motives, most notably those of the ancient, native cultures of North America. His 1997 article on electronic music for the All Music Guide can be found at Bob's Music Index. "...Gabel's appealing work sounded like no one else's... a unique and valuable Northwest voice." "Gabel's voice is distinct...style: a broad lyricism, nuanced electronics, New Age moodiness, modernist roots and humor." "...the aural ecstasy of Turtle Island...One of the most original and challenging CDs I've heard all year...a dreamtime journey that is as contemplative as it is hallucinatory." " Hellenic Triptych... hails from another musical world... epitomizes imagination and courage..."
" In the Land of Wu...a remarkably quieting piece, it has an affecting sense of great emotional space." " Whale Hunt Dream... evocative, mysterious tone poem of considerable beauty."